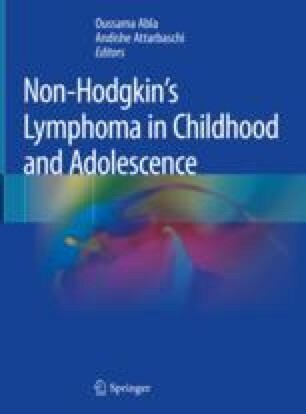 Non-Hodgkin lymphomas (NHL) are typical tumors for the pediatric pathologist to be familiar with as they represent around 7–10% of pediatric malignancies, the fourth most common one in children, being more frequent between 15 and 19 years of age (Minard-Colin et al. J Clin Oncol 33(27):2963–2974, 2015; Bollard et al. Pediatr Blood Cancer 60(6):979–984, 2013; Sandlund and Martin Hematology Am Soc Hematol Educ Program. 2016:589–597, 2016). These lymphomas could arise in any tissue, nodal or extranodal, and the pathologist should be prepared to diagnose its histological type according to the updated revised 2016 WHO Classification of Tumors of Hematopoietic and Lymphoid Tissues (Swerdlow et al. WHO classification of tumours of haematopoietic and lymphoid tissues, revised 4th edition. IARC, Lyon, 2017). Acknowledgments to Julie Bruneau, Danielle Canioni, Josette Brière, Sophie Kaltenbach, Isabelle Radford Weiss, Serge Romana, Elizabeth MacIntyre, Vahid Asnafi, Ludovic Lhermitte, and Chantal Brouzes for the fruitful and constant laboratory interaction in the multidisciplinary approach of pediatric lymphoid disorders diagnosis as well as Véronique Minard, Laurence Brugières, Bénédicte Neven, Despinha Moshous, and Comité Lymphome of SFCE for their crucial interaction considering the clinical part of the classification.